← Who should win the Ballon d’Or? Barcelona kick-off 2011 with a 6 pm (Spanish time) encounter at home versus 16th place Levante, despite the threats from AFE (Spanish Players’ Association) that players would strike and not play today. They argued that an agreement was in place with the LFP that players had between December 23 and including January 2 as mandatory rest days. A court in Madrid however rejected their strike request stating there was no such agreement and also stated that since the schedule was set back in July they should have attempted to get the dates changed sooner than 3 days before the games. However, many speculate the union really went to court to bring attention to another more serious problem going in La Liga, being that many players, most notably Hercules’s Royston Drenthe, are not receiving their wages from clubs that have overstretched financially and are in or near insolvency. It was probably a bit of both. Ok, back to the game. The smaller of the Valencia based teams returned to La Liga this year after 2 years in the second division having been relegated in 2008. Upon relegation Levante hired manager Luis Garcia Plaza (still in charge), who on his second attempt led his side to promotion back to La Liga after finishing 3rd in Segunda. Levante thus far have had a tough time back. They currently sit in 16th place with 15 points after managing in 16 matches to secure just 4 wins, 3 draws, and 9 defeats. Like most smaller sides, they do not travel well, managing to accumulate just 5 points (1 win, 2 draws) out of a possible 24 away from Valencia. Levante right now are just pretty average in both defense and attack. They have conceded 26 goals in just 16 matches, but so have others including Bilbao, Sevilla, and Sociedad. They also have only managed to score 18 goals (1.125 per match) thus far, making them among the worst going forward. In their most recent match on December 22, 2010, Real Madrid hammered them 8-0 in a Copa del Rey tie. There are however a few familiar faces in their ranks. One of our cantera boys Xavi Torres has become a key man in the midfield, where he is often joined by Sergio, who was once a very good player at both Espanyol and Deportivo. The one massive prospect Del Horno has found yet another home here also. Their main goal threat this season, Ecuadorian Felipe Caicedo however will miss the match due to injury. Onto our boys. Guardiola has a trickier than usual team selection tonight, as Puyol, Pique, and Messi will all not play. Our brave captain will not play tonight after picking up a minor groin injury in Catalunia’s 4-0 friendly win against Honduras on December 28, while Pique serves his mandatory 1 match ban after picking up 5 yellow cards. Thankfully, Milito was passed fit a couple of days ago (Jeffren was also). Therefore, Abidal will definitely slot into the center, where he has been quite excellent this season, and Maxwell logically takes on the left side. Who will accompany the Frenchman is the biggest uncertainty. Will he risk Milito so soon, or will we see Fontas or perhaps Bartra in? I would guess one of the cantera boys start due to better fitness. Lionel Messi will also not play after Guardiola granted him a few extra days of holiday. I’d guess Bojan will take his spot as a reward for his stormer in that Catalonia friendly, where he looked really confident and comfortable scoring 2 and directly assisting the other 2. Though maybe Iniesta is pushed forward and Keita or Masch step in. Otherwise, I expect Guardiola to put out his strongest side, firstly to try and get the team back to their great form of before as soon as possible, secondly to atone for the slightly disappointing home draw against Bilbao, and thirdly because you don’t want to tinker much more with 3 key men missing. Unfortunately, it seems we won’t get a glimpse of new man Afellay, something about league inscriptions not being taken until 3rd January, though Ibi has reportedly settled in very nicely with his teammates both on a personal and technical level. Personally I don’t see us having too much trouble tonight, despite the absentees. However, these breaks can sometimes follow with strange performances and results, something Pep himself highlighted as a risk. But, Guardiola has been quite clear publically that he views this as a tough encounter that will require total focus and commitment, which I think will transfer to the players. It’s unlikely to be a performance at the level of Madrid or Espanyol, but we should manage the win. I, unlike some of our other esteemed writers, will do something slightly different now, and not put a predicted starting 11 or predicted score line (though go ahead and do one yourself if its something you enjoy). I personally see predicting the starting 11 to have no value as when the match starts you will know exactly who’s playing and predicting scores for me has always been a rather futile exercise equivalent to playing the lottery. As a final note, which is one I’m personally so delighted about, if Xavi plays tonight he will equal Migueli all-time record of 549 first team appearances. I cannot think of a more deserving player. 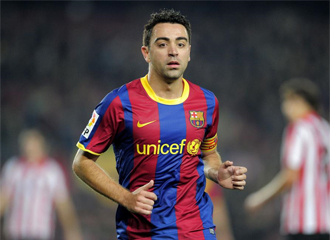 This entry was posted in La Liga, Match Previews, Xavi Hernandez. Bookmark the permalink. I’ll go with 6 for Barça, 1 for Levante. well 3 points are 3 points, especially after the break. levante came with predictable anti-football tactics but thankfully pedro came through for us. i was super annoyed with alves in the latter part of the game when he fluffed such an easy pass into the middle when we had a 3 man breakaway. i must also say i found guardiola’s substitutions today especially odd. why take masch out when we just scored? rather take off iniesta who did next to nothing second half and bring thiago on (who i like a lot these days). also i dont see why he took off maxwell for milito, was much more logical to leave abidal there (who was having a much better game as center back than busquets being in an unnatural position) and put milito with abidal. anyway. like i said, 3 points. Well, we often seem to have problems to get going after the christmas break and today we had quite a few changes in the starting XI which doesn’t help either. Pedro’s return to form in the last few weeks is a definite bonus, I was worried that he might struggle this season but he is proving me wrong and is now a vital part of this team. Abidal was again fine at centre back though Busquets didn’t look so comfortable. I agree with Blaugranaboy that Alves can be frustrating but his hard work paid off today in the two assists he gave to Pedro.